Major restaurants, take-aways and sporting venues are secretly serving up halal meat. In another twist to the scandal of lamb and chicken being dumped on all supermarket own-brand shelves with the exception of M&S and Morrisons, meat sacrificed to Allah is being served up in major fast-food outlets and popular pub chains. 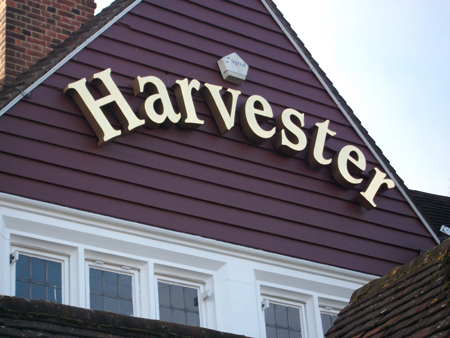 Halal chicken and lamb are likely to emerge from the kitchens in Harvester, Toby, Beefeater and Brewers Fayre restaurants. Whitbread, who own the latter two along with Premier Inns, have admitted that three-quarters of their poultry is halal. Mitchells and Butlers are responsible for Harvester, Toby and TravelLodge. They told Christian Voice that New Zealand lamb - of which 75% is halal - is being used as well as halal chicken in their outlets. Traditionally, halal slaughtering was carried out without stunning, and many Muslim clerics still maintain that stunning of any sort means the animal is not 'healthy' when it is killed. But the Halal Food Authority now allows electric stunning, having been shown that animals can recover afterwards - if they are not cut in the meantime. So the problem is not principally one of animal welfare. Except in some franchises, the companies involved are adamant that the meat they use is from animals which are stunned before slaughter. But in many British abattoirs, a Muslim slaughterman is saying 'Bismillah Allahu Akhbar' (Arabic for: 'In the name of Allah, Allah is the greatest') over a large proportion of the lamb and chicken which ends up on our tables or in take-away cartons. As there is over-production of halal meat, a lot of it is dumped on the non-halal market. So sporting venues like Royal Ascot and Wembley are selling halal meat. All chicken at Ascot is halal because it is 'easier to store and cook only one type of meat.' But it is not advertised as halal, which begs the question as to why the venue went down that route in the first place. At Wembley, all beef, chicken and lamb is halal, so a football fan with an objection to creeping Islamification has to stick to sausage rolls or bacon sandwiches. 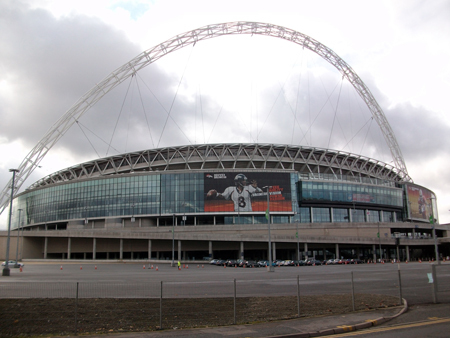 Again, there is no honest labelling at Wembley, nor at Twickenham, another sporting venue serving up halal chicken. Turning to the High Street, the burger chains, McDonalds, Burger King and Wimpy appear to be halal free, but pizza outlets Dominos and Pizza Hut both use halal chicken in their toppings, much of it from halal abattoirs abroad. Halal chicken is imported from Brazil , Thailand and Turkey , undercutting domestic producers. One might think to avoid halal completely by ordering a ham and pineapple or pepperoni pizza, but some independent pizza outlets in areas with a Muslim population refuse even to handle 'haram' meat, which largely means anything made from pork. It is fair to say that every kebab shop will serve halal lamb and chicken, if for no other reason than that the kebab is a middle-eastern invention. The kebab meat will be sourced from specialist suppliers, and if any of them are not Muslim, it would be very surprising. The same goes for curry houses. Most 'Indian' restaurants are in fact run by Muslims, not Hindus, and any restaurant run by Muslims will serve up halal lamb and chicken and will not announce the fact on the menu. The most famous fried chicken chain, Kentucky Fried Chicken, sources some chicken from abroad for its 780 shops, and has just under a hundred halal-only outlets, running as an on-going pilot. Southern Fried Chicken is the next biggest, with 400 branches, which all operate as franchises. Nearly all are halal, and we were told that many announce the fact on the window. Miss Millies, located around Bristol , are totally halal. It is fair to say most the fried chicken outlets are franchises (KFC is 50/50 franchise and company), and most operate in big towns. Muslims are concentrated in towns and are heavily involved in the take-away trade. Is it any surprise that a majority of chicken take-aways are halal? Halal outlets often have a halal sign visible outside, as much as to promote themselves amongst local Muslims as anything. Nandos, the chicken-based restaurant and take-away chain, have 234 outlets. Of these, 61 are halal-only and some chicken in the others is halal. Subway operate as a franchise as well, and a significant number of franchisees have gone halal, some of which put a sign in the window. Some halal Subways are so strict they will not serve pork, so a ham and cheese 'sub' is not on the menu. If there is no halal sign in the window or on the menu, the Christian customer can either keep quiet on St Paul's 'don't ask' principle (from 1 Cor 10:25) or ask the local restaurant or chicken take-away if they are serving halal meat or not. At the very least that is an opportunity to explain your point of view, and then to share the Gospel. The Scriptural witness on this matter has made me seriously review where I am prepared to eat. I used to like fried chicken take-aways and the odd lamb madras, but I can eat them no more without checking they are non-halal first. Of course there is always fish and chips. READ: Lev 19:4; Psalm 96:5; Isa 2:18; Dan 1:8; Zech 13:2; Acts 15:20, 21:25; 1Cor 8:1-13, 10:18-28; Rev 2:14.20. The same can easily be done with the restaurant and fast-food trade. Pray that the Lord guides and blesses this campaign and that He is glorified through it. As always, stress that it is the Islamic declaration to Allah, not the stunning issue, which is at the heart of your concerns. Domino's Pizza Group, Chief Executive Officer, Mr Chris Moore, Lasborough Road, Kingston, MILTON KEYNES Buckinghamshire MK10 0AB. Phone: 01908 580604. BOREHAMWOOD Hertfordshire WD6 1JN. Phone: 020 8732 9000. 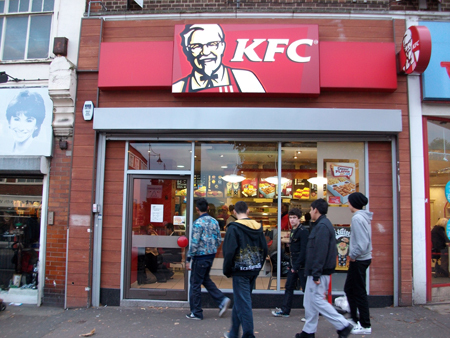 Kentucky Fried Chicken, Managing Director, Mr M R F Shuker, 32 Goldsworth Road, WOKING, GU21 6JT. Phone: 01483 717000. Nando's Chicken, Chief Executive And Director, Mr R C Brozin, St Mary's House, 42 Vicarage Crescent , Battersea, LONDON SW11 3LB. Phone: 020 7738 1120. Subway Realty Limited, Director, Mr Vickram Gupta, Chaston House, Mill Court, Hinton Way, Great Shelford, CAMBRIDGE CB22 5LD. Phone: 01223 550820. Royal Ascot, Chief Executive, Mr Charles Barnett, Ascot Racecourse, High Street, ASCOT Berkshire SL5 7JX. Phone: 01344 878501. Rugby Football Union, Chief Executive Officer, Mr John Steele, Rugby House, Twickenham Stadium, 200 Whitton Road, TWICKENHAM Middlesex TW2 7BA. Phone: 020 8892 2000. Wembley Stadium, Managing Director, Mr Roger Maslin, Wembley Stadium, Empire Way, WEMBLEY, Middlesex HA9 0WS. Phone: 020 8795 9000. Mitchells And Butlers , Chief Executive, Mr Adam Fowle, 73-77 Euston Road , LONDON NW1 2QS . Phone: 0121 498 6513. Whitbread PLC, Chief Executive, Mr Alan Parker, Houghton Hall Business Park, Porz Avenue, DUNSTABLE Bedfordshire LU5 5XE. Phone: 01582 424200. PRAY: Thank God for some good news! British Airways, Chief Executive, Mr M F Broughton, Corporate Headquarters, Waterside, PO Box 365, Harmondsworth, WEST DRAYTON UB7 0GB. Phone: 020 8738 5100. Email: martin.broughton@ba.com Thank Mr Broughton for BA's stand. Gate Gourmet, Email: cvoigt@gategourmet.com and explain to him that your opposition to halal food will not go away by managing your perceptions!